Hip hop overtook rock music as the most popular genre in the United States last year. Artists like Kendrick Lamar and Drake dominate the streaming game, tallying up hundreds of millions of plays with every release, while the likes of Cardi B, Future, Migos, Nicki Minaj and J. Cole don't exactly fall flat whenever they put new music out. All of those - and so much more - meant the total number of rap and hip hop streams sat at about 400 billion in 2017, almost double what it was in 2016. The world's view on hip hop and rap has changed so much in recent times Kendrick Lamar even won the prestigious Pulitzer Prize for Music last year with his album 'DAMN.'. Let's not ignore the fact that hip hop's been tasting commercial success for decades, though. Hop back to the '90s when the word 'streams' meant nothing more than a narrow flow of water, and hip hop was shifting millions of albums, Notorious B.I.G and Tupac flying that flag the highest. But there was also crews like A Tribe Called Quest and Wu-Tang Clan, alongside Nas, Mobb Deep and so many more. 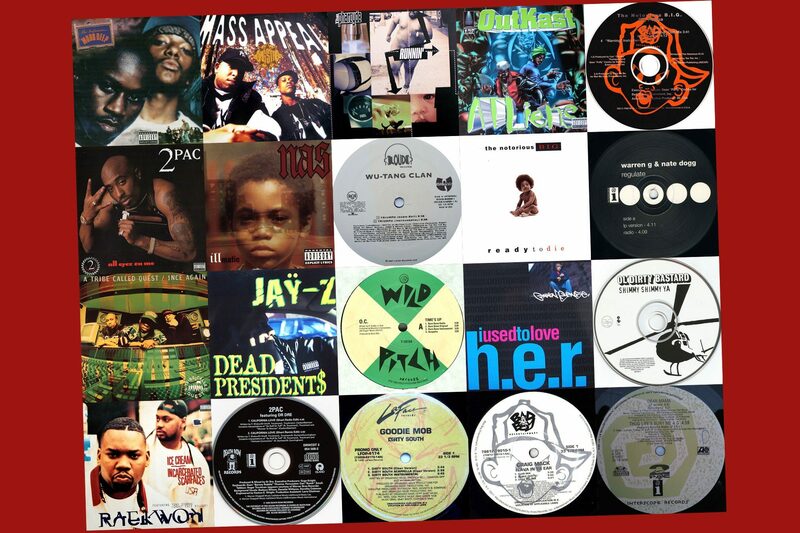 The mid-'90s was a period that spawned some of hip hop greatest records. It was a golden era so we've decided to compile our favourites from 1994 to 1996. Check them, in no particular order, below. There's just so much swagger to this. The creeping chords linger in the background, setting the scene of some sort of dark-alley thriller, with deathly synths sampled from Quincy Jones' 'Kitty With The Bent Frame' rearing their head throughout. Havoc's production provides the platform for Prodigy to assert his lyrical potency, cementing this one as Mobb Deep's finest songs. It left such a mark, the likes of Mariah Carey, Rick Ross and Jay-Z went on to sample it. Gang Starr's one-man production powerhouse DJ Premier admitted that the melody on 'Mass Appeal' was made as a joke to make a pop at radio stations. Turns out the tip-tappy bleeps set the foundation for a hip hop classic. Any gamers out there will recognise it from Tony Hawk's Pro Skater 4, where it was accompanied by tunes from N.W.A, De La Soul, Jeru The Damaja and Public Enemy. Producer J Dilla dug into the jazz archives to attain the cheeky guitar chords and saxophone that provide the backbone to 'Runnin', sampling 'Saudade Vem Correndo' by saxophonist Stan Getz and Brazilian guitarist Luiz Bonfá. It was the lead single from The Pharcyde's second album 'Labcabincalifornia' and a song with one of those hooks you just can't get out of your head. "Now throw your hands in the ayurrrr and wave 'em like you just don't cayurrrr." Everything about this iconic song from André 3000 and Big Boi screams party, underlaid with a slow-swaying bassline and, unsurprisingly, alien sounds. It bangs and features on, quite possibly, their best album. Biggie might have represented NYC rather than LA, but 'Big Poppa' channels that classic G-funk sound synonymous with the Californian city. Synths whirl and and The Isley Brothers-sampled pads whomp with the iconic rapper spitting his finest loving bars. No hip hop list in the world would be complete without mention of Tupac, obviously. 'Only God Can Judge Me' wasn't even released as a single on his album 'All Eyez On Me', but that doesn't mean it can't sit highly in the hip hop echelons. Just listen to that sleazy West Coast production. Proper cruising-through-LA-in-a-Cadillac business. Is 'Illmatic' the greatest hip hop album of all time? Probably. Nas' debut had the teenage MC telling tales of life in Queensbridge, New York, and no song on the album summed that up more than 'N.Y State Of Mind', for obvious reasons. Nas' lyrics go full-force atop of devilishly prodding chords and the most subtle keys glittering every now and then. "We got a six-minute song on the radio," RZA once said. "Six minutes man, that's serious, it's unheard of." You could say that was somewhat of a triumph, bearing in mind the song doesn't even have a chorus, just a verse each from the nine members. Every single one bangs. There's that sweet, little 'Ooooohhh' sample lifted from The Rance Allen Group's 'Just Found Me', too. It's haunting now looking back at how a 21-year-old Biggie entitled his debut album 'Ready To Die', for him to be shot dead a few years later. The album itself drew plaudits from across the board, especially so because of hits like 'Juicy' and 'Big Poppa'. But almost every other song on the album is worthy of love and this one sees Biggie in fiery form, puffing his chest out and aggressively spouting how he's ready to face up to the consequences of his actions. How many house parties have you been to when this has been played? You've lost count, haven't you? Warren G and Nate Dogg created an anthem, one totally G'd out party anthem of a song, telling a story of cruising through Long Beach, California, being robbed and hooking up with women. G-funk at its finest. Some of the most memorable hip hop lyrics, for sure, as A Tribe Called Quest's Q-Tip asks if the late Phife Dawg is ready to go. The song 'Beats, Rhymes & Life' is boom-bap rap brilliance, containing one of the catchiest choruses - delivered by vocalist Tammy Lucas - you're likely to hear in hip hop. Jay-Z's musical output might be divisive these days but there was no questions about the artist’s ability when he burst onto the scene in the mid-90s. Gentle piano chords sampled from Lonnie Liston Smith's 'A Garden Of Peace' are the foundation for Jigga to rap about money ('Dead Presidents' is slang for that, btw) and his transformation from hustler to being in the public eye. Recognise it? That's probably because you've watched the Eminem-starring 8 Mile, where the instrumental of O.C's 1994 song appears in one of the rap battles. Forget about its Hollywood appearance, though, 'cause the tune was doing damage long before the film hit the silver screen. The looped chords are a production masterclass and O.C goes in hard on phoney rappers claiming to be badboys or gangsters. A hazy, jammed-out hip hop special from Chicago's Common. The 'H.E.R' part of the song title is an acronym for 'Hip Hop in its Essence is Real', so the reference of a woman actually represents hip hop and Common's thoughts on what it was like in the late '80s and early '90s. We could listen to Common saying 'Yes, yes, yo and you don't stop' all day. Listen to this and you'll probably go to sleep with ODB's 'Oooh baby I like it raw' lyrics hovering in your ears they're so harrowing. That eeriness is added to with the unsettling piano keys, an eeriness which is completely unsurprising bearing in mind the late Wu-Tang rapper namechecks Norman Bates from horror novel and flick Psycho. Every single member of Wu-Tang Clan has released a solo album at some point, but Raekwon's 'Only Built 4 Cuban Linx' hits the hardest. 'Ice Cream' sees Raekown joined by fellow Wu MCs Ghostface Killah, Method Man and Cappadonna as they rap about "French-vanilla, butter-pecan and chocolate-deluxe." Raekwon's the ice cream man you never knew you wanted. A song that could be described as the ultimate hip hop anthem. One that announced Tupac's release from prison and was his first single after signing to Death Row Records. He did the business in terms of announcing his return to the game, bigging up Cali in the process, and ended up at number one on the Billboard Hot 100. A year after his death, the tune was nominated for Best Rap Solo Performance and Best Rap Performance by a Duo or Group at the Grammys. Most will namecheck Outkast or Three 6 Mafia if asked about Southern hip hop, but it shouldn't be forgotten that Goodie Mob were there from early, forming in 1991 and releasing their gold-certified album 'Soul Food' in 1995. 'Dirty South' basically outlines what Southern hip hop is all about and drills it into you that you should definitely be listening to it. Easily Craig Mack's biggest hit, 'Flava In Ya Ear' got the remix treatment with Notorious B.I.G, LL Cool J, Busta Rhymes and Rampage onboard. B.I.G was a relatively unknown artist at this point, though, and Busta was easing into his solo career. These guest appearances just about push the remix above the original version of the song. Still, the OG got nominated for a Grammy in '95. It wasn't often Tupac was in sensitive mood, but 'Dear Mama' had the artist drop his gangster persona to pay tribute to his mother, Afeni Shakur. There's no doubting 'Pac's skills as a poet and this is one of the most beautiful poems he ever penned.